Tom Waits:"Anywhere I Lay My Head"
So beautiful to put a poem on a pillow, it´s poetic. 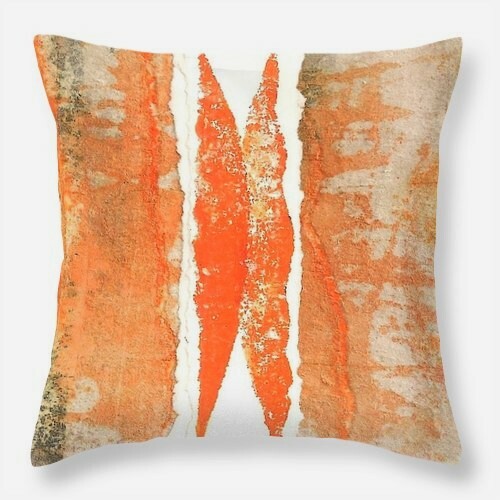 is it a real excisting pillow, this fabric? Looks fantastic. It's not a real existing pillow. Then I've copied the final result. Your art makes a wonderful pillow! Even though it is not real, maybe some day. I think all your art would make wonderful pillows, especially for a beach house to to brighten any room. Lovely weekend to you. and, as said before, it would be wonderful as a real one! Even the lyrics are great. 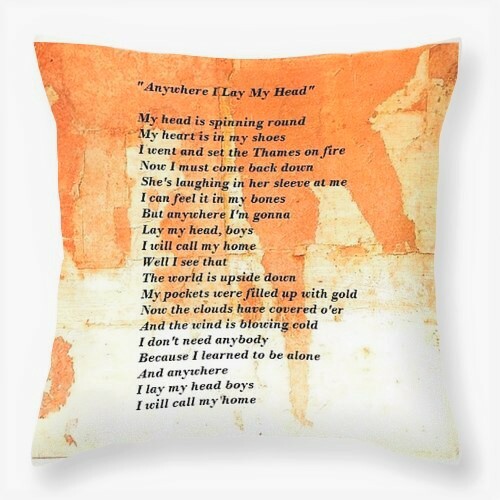 And true, wherever I lay my head, I call my home. Actually a very meaningful post. Especially these days. And I like, that your earthy cushion seems to be a metaphore for home. Thank you! Wow, lovely strong colour when all around is grey or white. Thank you! Hey you tricked me too with the pillow image. Have a great week, Eric.